“Going green” – Whether building a new home or remodeling an old one, many homeowners find that they are encouraged to consider their impact on the environment and choose “green” products. Although the cost of going entirely green can be overwhelming for most, many make the choice to include some features that are considered green. That is what the homeowners of this Highland Park(North Chicago),Illinois home decided to do in their kitchen. They wanted an organic, contemporary look for their new countertops made from a green and renewable product. Andrew Kerr, owner of Kerr Concrete in Evanston,Illinois, introduced them to the advantages of custom concrete countertop, not only was concrete a green product but their countertop would be like no other. Every concrete countertop can be considered “custom”; but, in this case, they were able to truly customize their new countertops with three built in features. 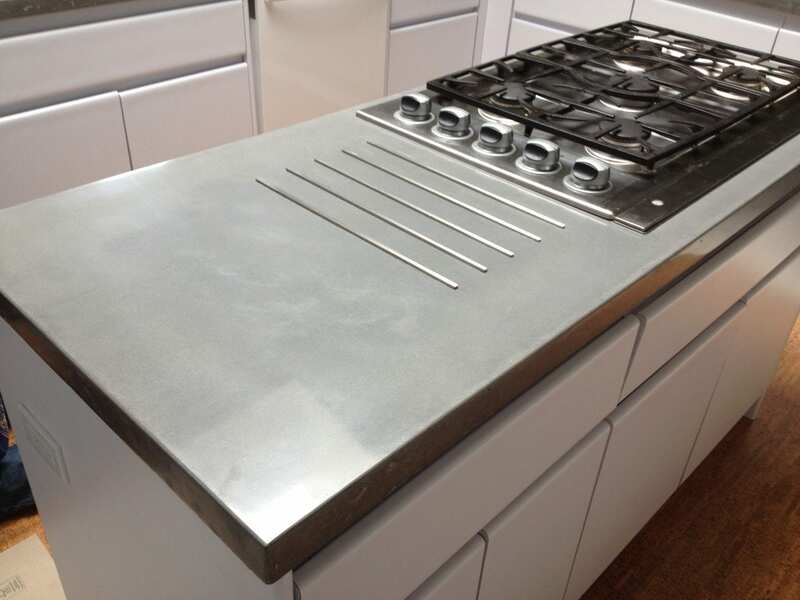 Beside the cook top there is an integrated trivet; equally spaced ¼” steel rods were embedded into the concrete countertop and protrude slightly from the surface. On one end of the custom concrete countertop there is a chopping block. It is recessed into the countertop and removable for easy cleaning. An integrated bowl is the highlight of the other end of the concrete countertop. Andrew and his team with Kerr Concrete used SureCrete’s Xtreme Series PreCast System for this one week long job. 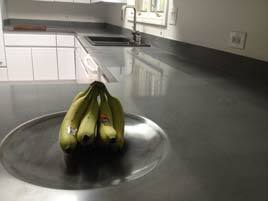 The Xtreme Series for concrete countertops is a great choice for those who want to “go green”. Custom concrete countertops are made locally, sometimes even on site, so there is minimal transportation required; they are made to exact specification so there is zero waste. The Xtreme Series PreCast Mix and Modifier contain zero VOCs as well. This concrete countertop was made up of five pieces. Grey color was added to the PreCast for the desired hue that would compliment the home’s contemporary pallet. A high-gloss finish completes the look. In this case, the low VOC XS-327 Hybrid Water-Based Polyurethane, by SureCrete, was applied and polished to achieve optimum shine. Specially formulated for use on PreCast concrete, this low VOC sealer is a great choice for those who go green but want outstanding durability.